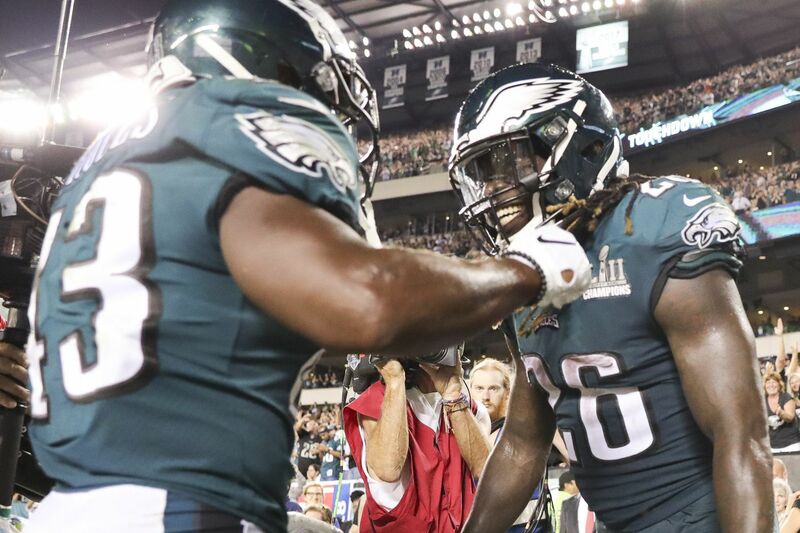 Eagles running back Jay Ajayi celebrates his fourth quarter touchdown run with teammate Darren Sproles. The Eagles beat the Atlanta Falcons, 18-12, at Lincoln Financial Field in the season opener. Here's a look back at the game as it unfolded in real time in our live chat. 2:19 4th — Eagles 18, Falcons 12: Jay Ajayi capped off an impressive late drive with an 11-yard run up the left side, then completed a two-point conversion run. 9:53 4th — Falcons 12, Eagles 10: Tevin Coleman scored on a nine-yard run, then Matt Bryant doinked the extra point off the right upright. 4:41 3rd — Eagles 10, Falcons 6: Jay Ajayi ran the ball in from just outside the goal line to give the Eagles their first lead of the night, and the season. 2:08 2nd — Falcons 6, Eagles 3: Matt Bryant kicked a 52-yard field goal to put Atlanta back ahead. 6:15 2nd — Eagles 3, Falcons 3: Jake Elliott hit a 26-yard field goal, though it was ugly and nearly missed wide right. 5:03 1st — Falcons 3, Eagles 0: After the Eagles' defense made two big stands deep in its own territory, Matt Bryant kicked a 21-yard field goal for the first points of the game. Pregame: The stands at Lincoln Financial Field were been evacuated due to a thunderstorm passing through Philadelphia, and the kickoff was delayed to 9:05 p.m.